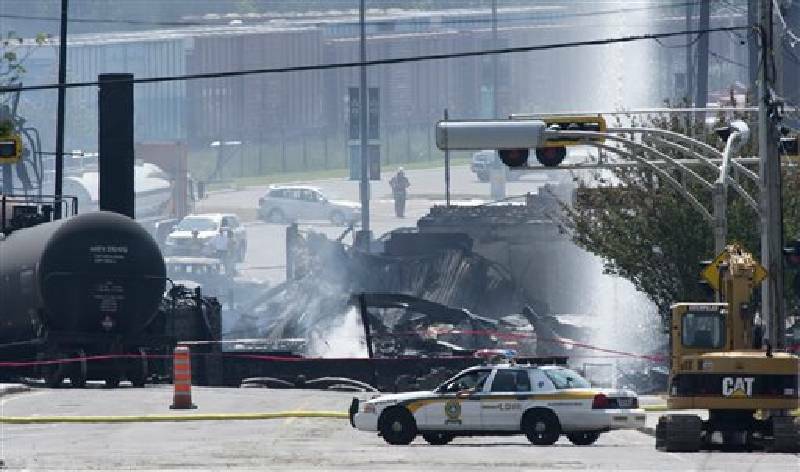 Burnt buildings are seen following a train derailment causing explosions of railway cars carrying crude oil Sunday, July 7, 2013 in Lac Megantic, Quebec. Two more bodies were discovered overnight after a runaway train carrying crude oil derailed in eastern Quebec, igniting explosions and fires that destroyed a town's downtown center. The confirmed death toll is now three, and is expected to rise further. LAC-MEGANTIC, Quebec - As firefighters doused still burning oil tanker cars, more bodies were recovered Sunday in this devastated town in eastern Quebec, raising the death toll to five after a runaway train derailed, igniting explosions and fires that destroyed the downtown district. With dozens of people reported missing, authorities feared they could find more bodies once they reached the hardest-hit areas. "It was like a movie," said Theberge, who considered himself fortunate to escape with only second-degree burns on his right arm. "Explosions as if it were scripted - but this was live."